Freeview Play: what is it? How can you get it? | What Hi-Fi? Freeview Play can be seen as a best-of-both-worlds TV service, giving you access to over 70 live channels (including 15 in HD) and the full suite of UK TV catch-up apps (such as BBC iPlayer) under one parasol. It uses an aerial for the former, and an internet connection for the latter. 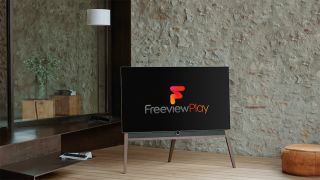 Freeview's connected TV platform, which was launched in the UK in 2015, has had growing support from manufacturers since its launch and now features on a plethora of TVs and set-top boxes. First out of the blocks was the Humax FVP-400T, but that's since been joined by several home cinema products, including other Humax boxes as well as select LG, Sony, Philips, Panasonic, Toshiba, Sharp, B&O and Hisense TVs. Freeview Play stands out from vanilla Freeview by adding the extra 'connected' element to TV viewing. The Electronic Programme Guide (EPG) can not only be used to access live programming, but also, thanks to a clever roll-back function, programmes that have aired in the past seven days. So if you missed yesterday's Corrie, you can simply scroll back in time and get your fill. As of very recently, Freeview Play is the only UK TV service where you can watch catch-up on-demand programmes from CBS' UK channel portfolio, which comprises CBS Reality, CBS Reality +1, CBS Drama, CBS Action, Horror Channel and Horror Channel +1. As with the other service apps, programmes are available for 30 days following their initial broadcast. An update is required to get this latest wave of exclusive catch-up content - it's available now for Freeview Play devices now (save for LG and B&O TVs, which will get it sometime next year). Ultimately, Freeview Play's grand design is to save people the effort of going into those catch-up apps and searching - heaven forbid we perform more remote clicks than we have to. The service has now integrated on-demand content into the live TV experience, too, launching a dedicated Channel 100, where users can see curated content recommendations from those TV services. Most Freeview Play devices also support other video streaming services such as Netflix, Amazon Prime Video and Sky's NOW TV. How can I get Freeview Play? While there were a limited number of ways to get Freeview Play when it launched in 2015, the service is now edging closer to ubiquity. According to Digital UK, the service is part and parcel of over 3.5m products already purchased in the UK. You have two options: buy a Freeview Play-toting TV (see below), or an external box like the aforementioned Humax FVP-4000T set-top box. On the TV front, a fair number of models from the manufacturers mentioned above have incorporated Freeview Play since 2016, and we’ll see many more this year. 2018 LG 4K OLED and Super UHD LCD TVs have the service (including the OLED55C8PLA and flagship W8), as will Panasonic’s 2018 4K TVs and forthcoming sets from Philips. Loewe is also integrating Freeview Play into its "bild" range of TVs with a firmware update in October. Last year, Sony brought the service to selected models, but its 2018 TVs instead feature the rival YouView platform (which you can read about below). The full range of supported devices can be found here. Freeview Play vs. YouView: What's the difference? You may think Freeview Play sounds nigh-on identical to YouView... and you’d be right. YouView also offers a connected TV service with seven-day scrolling EPG. But there are some differences between the two platforms. It's worth noting not all Freeview Play boxes come with apps for all the on-demand services. As Freeview Play is an open platform, TV and set-top box manufacturers can shape the service to offer what they like. Our advice: check before you get your credit card out. YouView, on the other hand, has the Netflix app on its platform by default, along with Now TV and (for those with a BT TV subscription) BT Player. Should you get Freeview Play? Freeview Play is aimed, first and foremost, at people who don't want to shell out for a TV subscription service from BT, Sky or Virgin. If you're ditching one of those, need a new Freeview box or are looking to upgrade your free TV experience, the service is certainly worth considering. It may be competing in a crowded market but, given 95% of the nation’s most-watched TV is available subscription-free on Freeview, it hopes the upgrade to Play will be as logical as upgrading your phone. And it's not going anywhere anytime soon. In the fight to sustain free-to-air TV in a landscape increasingly influenced by the likes of Netflix and Amazon, the BBC, ITV, Channel 4 and network operator Arqiva – the four shareholders of Digital UK – have recently agreed to invest £125m over the next five years to see Freeview Play become a ‘fully hybrid platform’.